Personalised Dirndl Apron. German Dirndl Aprons with Your Design. Whether you're travelling to Germany to visit one of their world famous festivals or have another reason to don the traditional German attire, add a personal touch with this customisable dirndl apron. Available in a choice of two fabrics you can match your German dirndl apron to the bodice and skirt, dress or blouse of your dirndl. Personalise your traditional dirndl or modern Landhausmode with custom made German dirndl aprons. In a choice of two different fabrics - soft-sheen Monroe Satin or robust Panama Flo - you can use photos, images or text to design your own unique dirndl apron. When using our simple online design tool you will notice a red dotted area around the edges of your dirndl apron; this is the trim area which makes up the hem. It is important to make sure that this area isn't left plain (unless of course your design intentionally leaves the edges white) but also that no important parts of your design occupy that area. Historians disagree on whether or not the knot positioning of your German dirndl apron has a historic or traditional background, however, it has become a time-honoured ritual to follow the bow-tying-code. This is said to signify that the wearer of the apron is single, and might like to be approached or addressed. This signifies that the lady wearing the dirndl is married, engaged or not interested in dating. This shows that the wearer of the dirndl apron is still a virgin. This means that the lady wearing of the dirndl apron is widowed. The Panama Flo fabric is a stiff, coarse material with a matte finish that feels the same on both the front and the back. It has a small amount of elasticity in it and has a water-resistant nature - perfect for wiping clean if you happen to spill anything down it. It is a comfortable fabric that holds its shape well and returns crease-free to its natural state. The white base tone of Panama Flo gives clear detail and strong colours. The Monroe Satin is a fluid feeling textile that has a soft, shiny front face with a back that is matte and has a grainy texture. The base white base colour of Monroe Satin offers crisp lines and beautiful detailing. The sheen on the front of this textile gives a very glossy, sparkling finish. Both options feature a white satin ribbon which is hand stitched to your apron; the ribbon is one metre long, which means that you can tie it in whichever fashion you prefer. 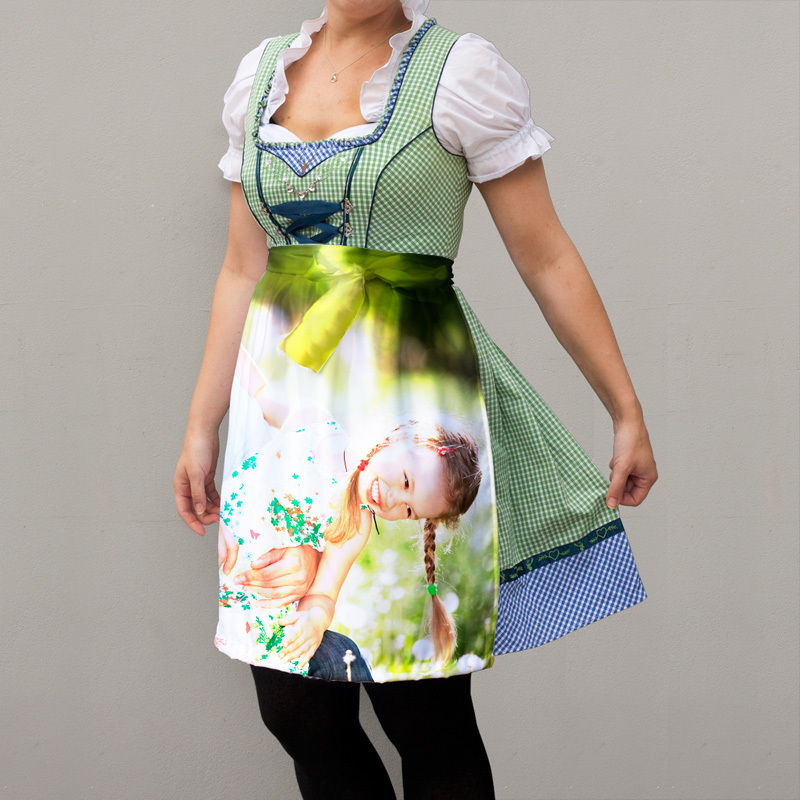 Your personalised dirndl apron is handmade to order based on your design in one of two fabrics, dependant on the choice you make in the online design tool. Your design is printed onto the fabric using a deep infusion method. Our technicians use this digital technique to bond the inks deep into the fibres of the fabric, resulting in a long-lasting, high-quality print. Our craftsmen will then cut your dirndl apron to size and shape before our seamstresses hem your garment and finish with a satin ribbon. As all of our hemming is done by hand, here in the UK, and we can't say that the seams will take up exactly all of that space, and while we don't want to leave gaps in your design, we also don't want to cut off an important part of your images. If you're not sure which fabric to go with for your custom made German dirndl aprons try matching it to the rest of your dirndl or Landhausmode. This could be in the small details such as the buttons or embroidery, or in the larger pieces; for example, if you have a satin blouse. If your design has a high level of fine detail you may find the Monroe Satin a great option, or if you are looking for a lighter summery design then try the Panama Flo. If you and a group of your friends are all heading out to one of the notorious German festivals, design themed custom German dirndl aprons for each of you. Use your favourite group snap, and add a nickname to each photo dirndl apron along with the date of the festival, and not only will it make up an important part of your outfit, but it will double as a personalised keepsake of the time you spent together. Customise your own BBQ apron with your photos or designs, perfect for summer parties. Handmade to order in the UK. Printed personalised scarf, wrap or shawl that you design online. Printed and made to order with your design image or graphic. Create a high quality waist apron the way you want it!